I am pretty sure that just using the tools we have and that I have additionally identified, we can sustain a population on the land surface of close to 100,000,000,000. This particular trick opens the door to a population base ten times larger than that or 1,000,000,000,000 or a trillion folks. Such a population would be engaged in optimizing recycling and the careful continuous management of the land itself. These figures will appear unimaginable, but I assure you that the one hundred billion is a practical target and allows close management of all usable lands. It has been discussed in other posts in this blog. Thus augmenting natural food with nutritional fortification is a practical advance hat merely makes it far easier than would be otherwise. Last night, I attended at a house warming at a high-rise condo in Vancouver. The complex included two 36 story towers close by with a combined ground floor complex to support it. There were ten condos per floor for a likely total approaching 800 suites. The implied population was certainly around 1200. It occupied the end of a narrow block taken up by a spacious park. Attaching such a unit to a fifty acre farm is easy and does not take from the plantable acreage at all. Yet the farm suddenly has access to a local market and prospective temporary labor. I added this last to make clear just how easy it is to populate a square mile of Earth with 20,000 people with no one particularly crowded at all. The land would find it difficult to actually support 20,000 people with conventional methods although 2000 is completely plausible and even easy with willing hands. Augmenting nutrition makes it possible to go to 20,000. The potentially available land area is around 50 million square miles. I have reason to think that we could ultimately occupy most of that if we wish. Thus reducing the number to 40 million is reasonable. In that case a land population of eight trillion is even plausible and a figure of one trillion becomes down right conservative. Solve for X is a place to hear and discuss radical technology ideas for solving global problems. Solve for X was set up by Google. Radical in the sense that the solutions could help billions of people. Radical in the sense that the audaciousness of the proposals makes them sound like science fiction. And radical in the sense that there is some real technology breakthrough on the horizon to give us all hope that these ideas could really be brought to life. This combination of things - a huge problem to solve, a radical solution for solving it, and the breakthrough technology to make it happen - is the essence of a moonshot. David Berry gave a Solve for X talk about radically more efficient nutrition production. David Berry is a Partner at Flagship Ventures and CEO of Essentient. David has MD and PhD degrees and has founded several life science and sustainability ventures. The cow is, to put it mildly, not the most efficient mechanism to turn basic ingredients like CO2, water, and sunlight into calories and nutrition. Soy beans are better, but it is still an extremely inefficient process. What if we could skip many of the intermediate steps and directly convert the basic components of food into calories and nutrition. Such a solution would leap us forward by more than an order of magnitude in our ability to feed the world. How do you do that without using more water that's already on the planet or wrecking the environment? Berry's answer is to understand the molecular nature of food and create a food source that converts the basic components of food directly into calories and nutrition, instead of having "intermediate steps." Creating nutrients directly at less than a tenth of the cost we see today. Essentient’s "nutriculture" technique combines protein science, a molecular understanding of nutrition, and low-cost, sustainable production systems, all in an attempt to improve on the agriculture-based system of consuming nutrients that we’ve relied on for thousands of years. "We took single-cell photosynthetic organisms, and we asked the question, 'Can we find something that has the right features, the ability to live in saltwater, the ability to have a robustness for our process, the ability to withstand the right sorts of thermal tolerances to be productive outside, and the ability to produce at very, very high qualities?" he says. After much searching, Berry and his team found these organisms. They gave them the ability to take in sunlight, CO2, water, a final ingredient that changes based on the end product, and the ability to secrete a pure nutrient when all these ingredients come together. At a basic level, it’s not much different from what Joule is doing. The company already has some products in the pipeline, including one that gives "gold standard nutrition" and tastes like sugar, another that feels and tastes like fat (without the nasty health consequences), one that helps build muscle, and a product that cuts down on appetite. "This is designed to be formulated with food we know today. We have no interest in replacing food," says Berry. They screened several thousand organisms that can work with non-fresh water, CO2 and sunlight and secrete one key nutrient. A continuous process instead of batch and produce pure product (so no high cost purification). Essentient is currently testing a sixth-generation version of its nutrient production system. Berry hopes that the end result will be a system that produces pure nutrients at up to 220,000 pounds per acre per year (the global record for agriculture is 3,600) at less than 20 cents per pound, all while generating 99% fewer greenhouse gases than conventional farming means. 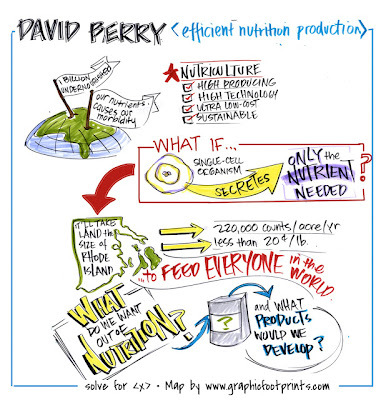 To provide what Berry calls "baseline protein nutrition" for every chronically undernourished person on the planet, it would only take the land area of 250 square miles. To provide complete protein nutrition to everyone in the world, it would take the land area of Rhode Island. - 20 cents per pound and does not use fresh water or land. BIO - David Berry is a Partner at Flagship Ventures and CEO of Essentient. He has founded several life science and sustainability ventures, including LS9, Joule Unlimited, Theracrine, Eleven Biotherapeutics, and Essentient. He received his M.D. from Harvard Medical School and a Ph.D. from MIT, where he served as a member of the MIT Corporation - its Board of Trustees. Among his over thirty scientific and academic awards, David was named as the Innovator of the Year under the age of 35 by Technology Review and received the prestigious Lemelson-MIT Student Prize for invention and innovation. "In that case a land population of eight trillion is even plausible and a figure of one trillion becomes down right conservative." - Thankfully I will be long gone by that time. Just like now you could read a headline that says, 'Building collaspe kills 20 million', and the rest of the world's populaton reads that and gets up from the sofa and goes on about their own business like it is no big thing. I will be glad to be long gone and not even remembered.